Following the chance meeting, Varun becomes somewhat curious about spirituality and agrees to come to Prasanthi for the weekend to continue his education in spirituality. Saturday arrives and Varun is in Prasanthi and has His first darshan (this is set in 2009). After this, Varun and Vivek discuss many things. The current episode takes us to the discussion Varun has on his second trip to Prasanthi. Eager to know more, he is promptly back the following weekend. Even as the two friends catch up, lets listen in. VARUN: So Vivek, here I am back again, eager to pick up from where we broke off last time. VIVEK: Sai Ram Varun! Nice to see you here once more. Well, it is your call this time, so you lead. VARUN: Thanks Vivek. If you recall, when we parted last, I was asking why, if God is everywhere and is so very compassionate, He does not do anything about the huge mess we are now in. VIVEK: Good question and one that is asked ever so often. Before I try to answer the question, can I ask you why we are in such a mess, I mean who is responsible for the creating this mess, as you call it? VARUN: I guess you are trying to make me say that it is man who has created the mess; right? VIVEK: Varun, it is not that I want to trick you like a trial lawyer or anything like that. 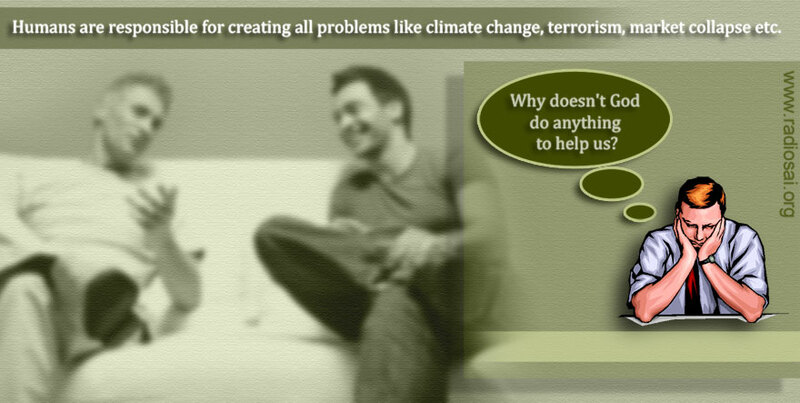 But don’t you agree that all these huge problems, be it climate change, terrorism, and even market collapse – have been created by humans? VARUN: OK, it is us humans who are responsible, but right now when so many people are suffering so much, why does not God do anything to help? VIVEK: Look. Suppose God were to appear right now, right here, and say: “Son, I want you to do such and such a thing; if you did that, things would improve.” If God were to say that, are you prepared to do what He wants? VARUN: Well, that depends upon what God asks me to do! VIVEK: See! You want to impose conditions!! 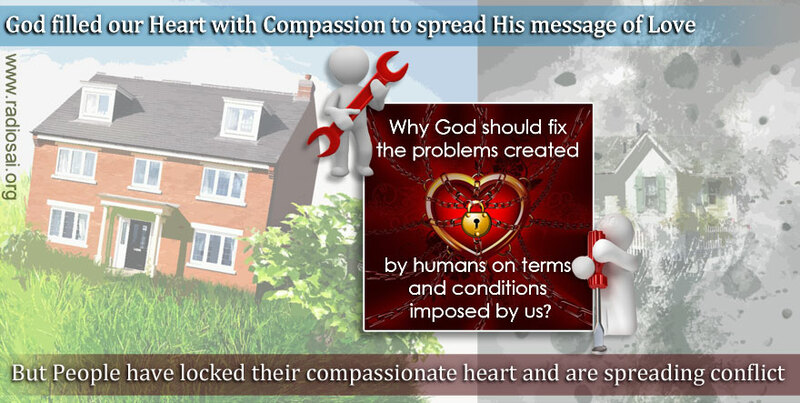 I don’t understand why God should fix the problems created by humans on terms and conditions imposed by humans. VARUN: Vivek! Be serious; you know that my point is very different. VIVEK: Frankly, I do not see any difference. The earth was created by God, and He gave it to man in an absolutely pristine condition; you can’t deny that. But what does man do? He wrecks the earth and its biosphere to an unimaginable extent. God filled man’s Heart with Love and Compassion, expecting man to use this inexhaustible resource liberally, to spread peace and harmony. But what does man do? He locks up his Heart, throws away the key, and then goes about spreading hate and conflict. Not merely that; he invents the most terrible weapons that one can imagine, weapons that can exterminate hundreds of thousands in the twinkling of an eye. I can go on and on. And now, at the end of it all, God is expected to simply come in as a repair man and do the fixing! Is there nothing that humans must do by way of, shall I say, contributing their share to the restoration of normality? VARUN: I read you! You are saying that God is not going to come for free but has a price! OK, what is the price? VIVEK: Come on Varun, don’t talk like that! You seem to imply that God acts like a businessman or a service vendor. VARUN: I don’t know how you feel but I am not at all happy about the way you are putting things across. If I read you correctly, you are saying that God would demand some terms and conditions prior to helping us, even though we are in a dreadful mess. If that is the case, then how do you expect me to accept God to be the Most Compassionate One, as devotees hail Him to be? VARUN: What are you sighing about? Isn’t there some truth in what I am saying? VIVEK: Varun, I am sorry to disappoint you but your argument is absolutely wrong, wrong all the way; and I am sighing because you are so much off track! VARUN: Well, if you think I am so horribly mistaken, then why don’t you educate me? Frankly, I don’t see you give me a straight answer; all that has happened during the last few minutes is that you are taking me round and round in circles. I am sorry to be brusque, but then you know me from old times, don’t you? I don’t easily accept things told to me; I always need to be convinced first, and I have not changed since becoming a techie; if anything, these days I am more sceptical about things that do not have a solid basis in the material world. VIVEK: I understand exactly how you feel and shall respond, keeping your sensitivities in view. Now, let me see how to start? OK, let us say there is a boy ten years old who is supposed to be full of promise, who with plenty of good coaching and some tough experience, is likely to become a terrific cricket batting star. This boy is brought to an expert coach and left with him. How do you think the coach must deal with this promising young kid? VARUN: That’s easy! The coach must put the kid through a tough training program. VIVEK: You would agree of course that the training would include not only many sessions at the net but also a lot of routines meant to improve physical fitness, fielding, concentration, mental toughness, etc. VIVEK: And you know great coaches are always tough, very strict and most demanding, even when their so-called students become stars. VARUN: That is very true, especially in tennis, for example. VIVEK: Right. I am mentioning all this because God is really like a coach who is training us to play big-league matches. 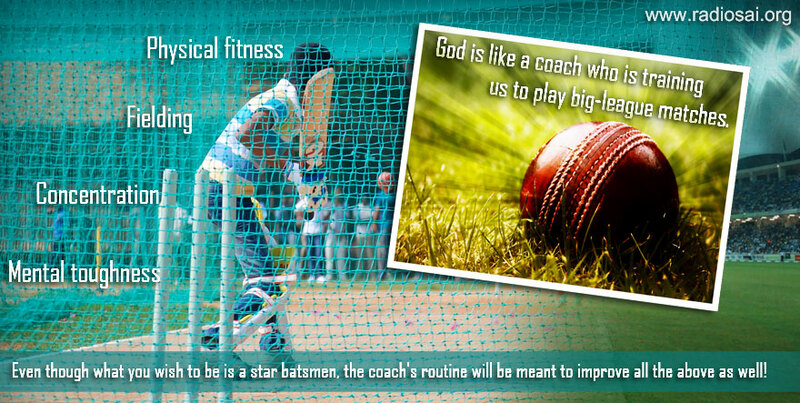 VARUN: God a coach? This is a new one! I always thought God was up there somewhere, welcoming the so-called good guys and sentencing the so-called bad boys. VIVEK: That really is the problem! VIVEK: You see Varun, most people have an absolutely wrong view of God. Contrary to what most people think, God is not somewhere far away, but right inside you! Are you aware of that? VARUN: Come on Vivek, you must be kidding! God inside me? What a joke! God is in you, above you, below you, behind you, up in the sky, on top of the mountain, deep in the forest – He is everywhere. In short, He is Omnipresent; most important of all, you yourself are a Spark of the Divine. 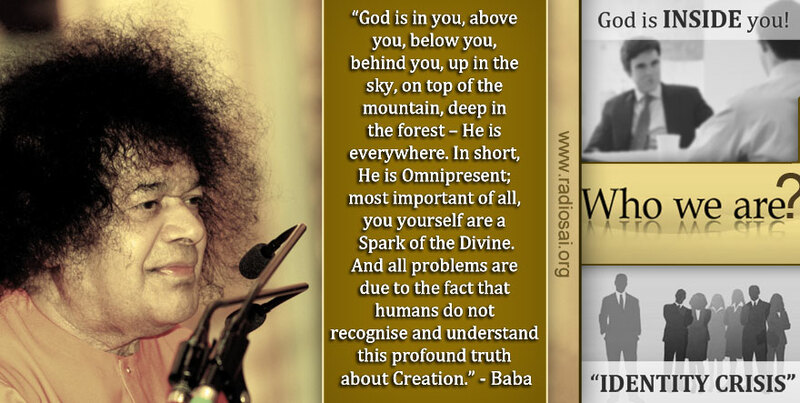 And all problems are due to the fact that humans do not recognise and understand this profound truth about Creation. VARUN: Vivek, in one short minute, you have completely lost me! I am afraid you have got to explain all that slowly, and step by step. VIVEK: Would be happy to Varun, because truly speaking all our problems start from a serious identity crisis. VARUN: Vivek! What’s going on? You are beginning to sound like a head-shrink! VIVEK: No Varun, just be patient for a while and soon everything would become quite clear. VARUN: OK, I am willing to give you a try; go ahead. 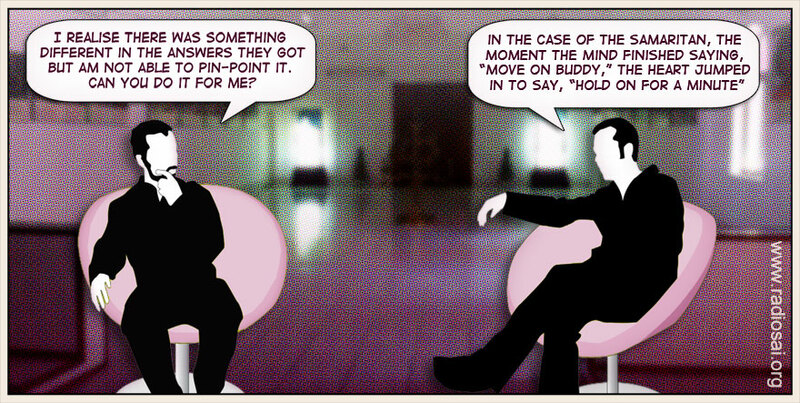 VIVEK: Varun, Swami says that all our problems begin with the fact that none of us are aware as to who we really are. VARUN: Is this the Identity Crisis you mentioned earlier? VARUN: But Vivek! You can’t be serious!! Do you mean to say I do not know who I am? That’s absolutely ridiculous!!! VIVEK: OK, in that case, why don’t you please tell me who exactly you are? VARUN: I really can’t believe all this but since you are asking me, let me make matters simple. Here, take this business card; it tells you a lot about me, at least to first order. VARUN: [sounding a bit annoyed] What are you laughing about? What’s so funny? VIVEK: Hold on dear friend; we are just getting started and we have some way to go; please be cool for a while and after I am through, you can snap at me as much as you want. OK? Is that a deal? VARUN: I simply do not know what to say, except that this whole thing is getting curiouser and curiouser! [sighs] OK, carry on; let’s see where all this takes us. VIVEK: Don’t worry Varun, soon you would feel really different and begin to see things in an entirely different light. Let me start with a couple of questions: What is a human being made up of? I mean, what are the constituent units of his/her personality? 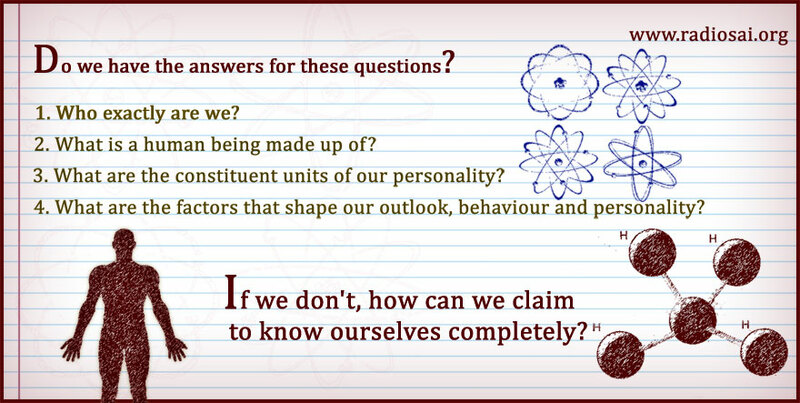 In other words, what are the factors that shape the outlook, behaviour and personality of a person? VARUN: Let me see. To start with, there is of course the body. VIVEK: Yes, and let us note in passing that the gross body made up of molecules and atoms of various kinds. The gross body as I call it is certainly one component of all of us. VARUN: I am glad that regarding that point, I am on the same page as you. Other than the body, I guess we can talk of the Mind, and maybe the emotional nature of the person. Have I got it right? VIVEK: Partly, I would say. VARUN: Why only in part? VIVEK: Well, I agree that we all have a gross body and also a Mind which, by the way, is a subtle entity. Regarding the third aspect, namely the emotional component, it is true we humans do have an emotional side, and this certainly is the view held by modern psychiatrists. However, from a Spiritual point of view, what is more important is the Soul or, if one wants to be a purist and use the traditional term, the third and I would say the most important component of a human being is the Atma. VARUN: Atma? Is this where Spirituality comes in? VARUN: OK, but whatever happens then to the emotional aspect? You can’t sweep it under the rug, can you? VIVEK: Not at all. Before I deal with that, what exactly are you referring to when you speak of the emotional side? My guess is that you are thinking of various desirable aspects and traits like compassion, generosity, etc., on the one hand, and tendencies like hot temper, stinginess, propensity to cheat, etc., on the other. Correct? VARUN: Yes, those are the things I had in mind. VIVEK: Good, in that case, we really do not have much of a disagreement. You see Varun, in the Vedantic picture, the good qualities that I referred to all flow from the Atma, while the bad qualities like cheating, telling lies, being jealous, etc., are associated with the baser aspects of the Mind. 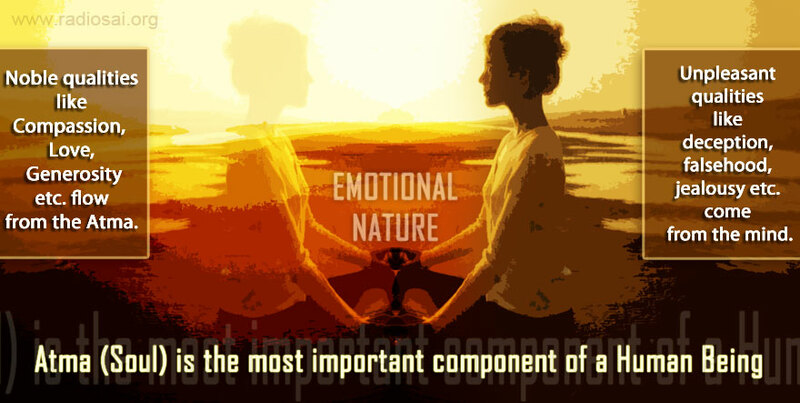 In other words, there are two agencies that seek to shape our emotional nature. Are you able to follow what I am saying? VARUN: Not really, but this much I seem to gather, namely the Mind and the Atma are in some sort of a competition to shape our emotional personality. VIVEK: By and large, that is indeed the essence of the matter but behind that headline lies hidden a lot of details and they need to be spelt out. VARUN: OK, go ahead and educate me. VIVEK: Will do, and maybe I should start with the famous story of the Good Samaritan; surely you must have heard that. VARUN: I have but that was a long time ago and have forgotten the story; so, why don’t you repeat it for my benefit? VIVEK: Sure will. It all began when Jesus was addressing a gathering on matters spiritual. 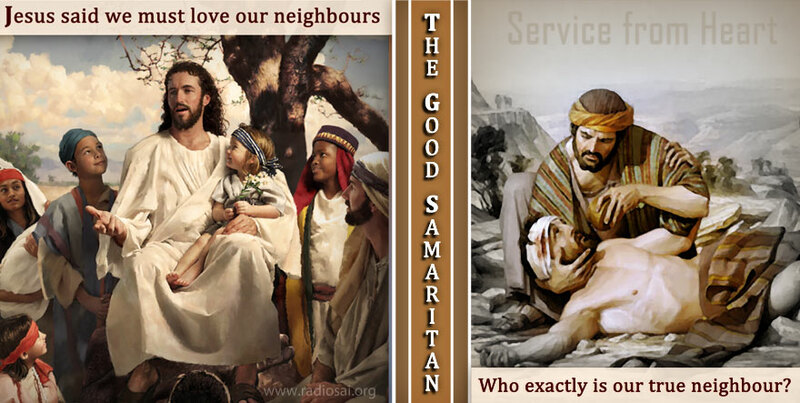 During his discourse, Jesus said we must all love our neighbours. A heckler-type then asked, rather mockingly I must say, “But who exactly is my neighbour?” That was when Jesus narrated this famous parable. VARUN: What was the parable and how did it answer the question asked? VIVEK: That exactly is what I am coming to. The story begins with a man travelling on the lonely road leading from Jerusalem to Jericho, when thieves suddenly fell upon him, robbed him of everything he had, beat him up black and blue, and then left the poor fellow utterly helpless by the side of the road, almost half-dead. A little later a priest passed that way, saw the wounded man and noticed that he desperately needed help, but did not pause to even enquire what happened. Shortly thereafter, a Levite passed that way, and he too ignored the wounded man, though he was well aware that the hapless traveller urgently required assistance. VARUN: Perhaps they were busy as we are these days, and just kept moving on, even as most people would these days. Frankly, I do not see anything peculiar about this, because this is precisely what happens in all cities every single day. What is interesting is that even two thousand years ago, the situation was no different. VIVEK: That’s right; in certain respects, the world simply does not change. Anyway, to get on with the story, sometime later, there came a man from Samaria and he too saw the wounded traveller. Unlike those who had passed by before him, this Samaritan stopped, rendered first aid by pouring oil over the wounds and bandaging them, then mounting the injured man on his donkey, took him to an inn and stayed with him all night. VARUN: That’s interesting; so this poor guy who was wounded and robbed was not left totally high and dry. VARUN: That’s a nice story. Let us explore a bit further and ask: Why did the first two not stop and help? They must have clearly seen that the injured wayfarer badly needed help; yet they did not offer any help. Why was that? VARUN: Maybe they felt that if they stopped to help that would delay them or something like that. VIVEK: What you are effectively saying is that they asked: “What’s there in it for me?” And not finding any return for the investment of time they would have to make, they just moved on; right? VARUN: I guess that is the way they must have reacted. VIVEK: Well, in that case, why did the man from Samaria stop to help? What was there in it for him? VARUN: That’s a good question! I guess he felt compassion for the wounded traveller and that’s why he stopped to help him. VIVEK: I would accept that comment but you have still not explained what specific benefit or advantage he got by doing what he did? VARUN: Oh that; I guess he felt some kind of satisfaction in helping a person in distress. VIVEK: You have got the point; he got the joy of doing service and being of help to one who was badly in need of assistance. You see Varun, in his case also his Mind must have automatically raised the question, “Hey, if you stop to help, you are going to spend time; what’s there in it anyway for you?” Somehow, something inside gave a different answer as compared to the answer the first two got. Can you comment on the difference? VARUN: I realise there was something different but am not able to pin-point it. Can you do it for me? VIVEK: Sure. You see Varun, in all cases, the Mind asked the same question – “What’s there in it for you?” In the first two cases, the Mind itself then gave the answer, saying, “Nothing buddy, keep moving!” The priest and the Levite accepted that answer and did just that, i.e., moved on without offering any help. VARUN: And in the case of the Samaritan? VIVEK: In his case also the Mind asked the same question and then gave the same answer. VARUN: But the man stayed on to help; how did that happen? VIVEK: Ah, that is the real and interesting point about the story. 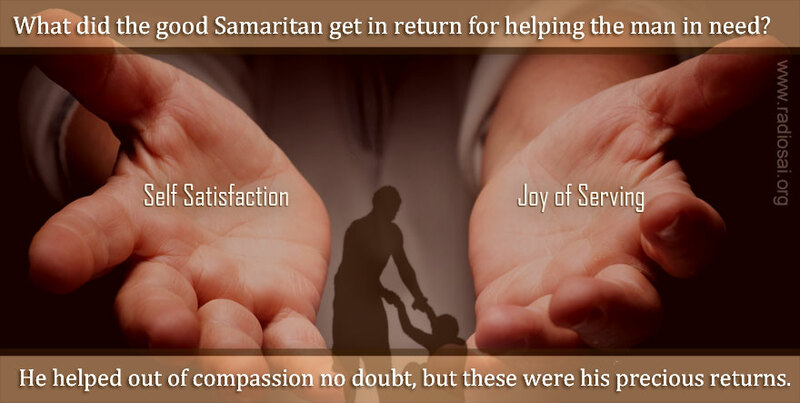 You see, in the case of the Samaritan, the moment the Mind finished saying, “Move on buddy,” the Heart jumped in to say, “Hold on for a minute". VIVEK: Well, it is not all that difficult to understand, but have you taken a look at your watch? I think we ought to take a break at this point, and meet again later. VARUN: Shall we do it like last time, that is to say after evening darshan and dinner? VIVEK: I think that would be fine, and in fact, we could take a nice walk while we discuss. VARUN: That would be great. By the way, let me tell you that I find this most gripping! VIVEK: Me, I find it equally stimulating because so many of my ideas are getting clearer! Both of us are sure benefiting from this Satsang! See you later then! What are your impressions about this dialogue? Please share your feedback by writing to [email protected] . Do not forget to mention your name and country please.